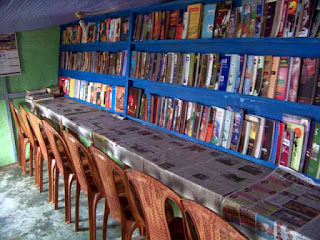 Mukesh Sharma: A school dropout, Bipal Rasaily(21)is running a small library at Munsong about 23 km from Kalimpong Town. Bipal, who works as a reporter for a local channel based in Kalimpong, felt the necessity of a library in his area. “I always wanted to give back to the society,and then I thought, what could be better than education? That is when I started Munsong Library Institution,” Bipal said. Started way back in 2011 with 34 books the present strength has gone upto 900 plus where about 70 students have enrolled themselves. The 16 x 8 ft library contains donated books from different people.Books in English,Nepali,Hindi and Bengali along with short stories, general knowledge,reference books are available.However, there is space constraint. A teacher of a government school has donated ten chairs, after hearing about his motive to spread knowledge among one and all. Bipal appealed to one and all to donate books which are lying in their houses unlooked for. too visited the library and congratulated Bipal on his effort and hard work. Meanwhile, when asked about state aid for the library, District Library Office Amrit Subba said there are some procedures to be followed. SDO Kalimpong Nirmalya Gharami said that there is a separate office where library registration is done.